Now that the costumes+candy has passed, what are you going to do with all those photos? Well, I think we can help ya with that here. 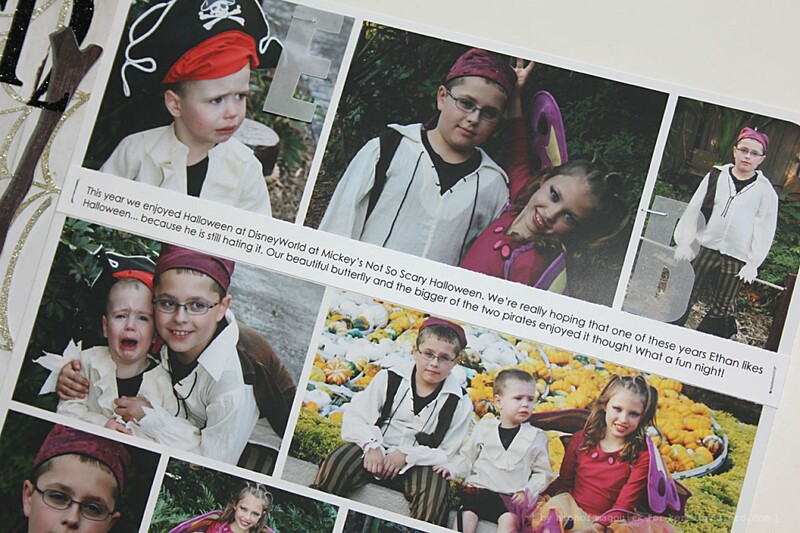 Take a look at what Nichol has done for the photos of the ghosts+goblins in her home. Can I just say, fabulous! Photo templates are so perfect for multiple photos. It keeps your layout clean, yet so fun with more than just a photo or two. The photo template makes it ‘one photo.’ And nobody can create a scene better than our Miss Nichol. Love the scale…the houndstooth, laced-up witches boots…the web subtly in the background of the whole page…just all of it. It’s like Where’s Waldo. You have to inspect every little thing to see all the yumminess. I love creating fun scenes with Kerri’s die cut shapes and word art for my scrapbook pages. Since we just had Halloween I thought I’d work on our families Halloween Cosumes MIni Album. This two-page 8×8 spread is from 2008. 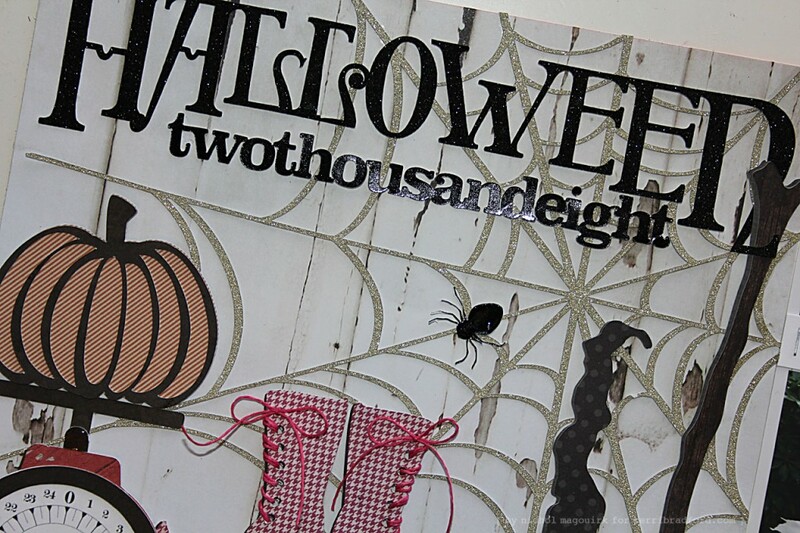 I used one of Kerri’s photo templates to make adding lots of photos on a smaller format a snap and created a Halloween scene on the left side of the layout spread combining lots of fun Halloween (and non-Halloween) elements for visual interest! I layered the year and month die cuts over one of the photos on the right side of the layout and stapled vellum die cut monograms over my kids’ photos as well. I printed journaling on a white paper strip and attached it over the photo collage to complete my page. 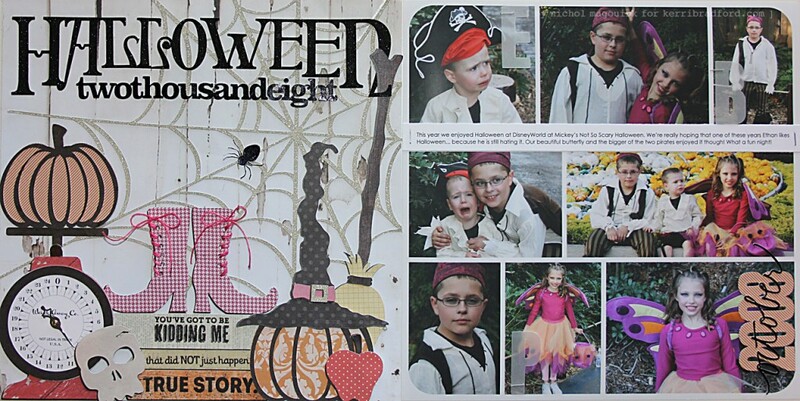 I LOVE, LOVE, LOVE this layout by Nichol and will be making a similar layout for my grandkids’ Halloween pics for this year! Kerri, your images from the this+that kits are perfect for this!